The Trump administration released two final rules Wednesday finalizing their interim rules regarding entities with religious objections to covering their employees’ contraceptives. The first rule provides an exemption from Obamacare’s contraceptive mandate for entities and individuals with religious objections to the mandate. The second rule provides an exemption to nonprofit organizations, small businesses, and individuals with non-religious but moral opposition to such coverage. "The religious and moral exemptions provided by these rules also apply to institutions of education, issuers, and individuals,” the Department of Health and Human Services said in a statement about the rules. “The Departments are not extending the moral exemption to publicly traded businesses, or either exemption to government entities." 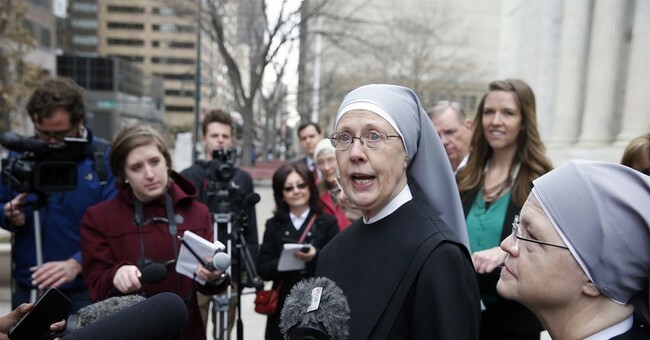 When the Obama administration initially introduced the mandate, The Little Sisters of the Poor and other nonprofit religious organizations that had religious objections to it were forced to sue. Their case was remanded to appeals courts with direction from the Supreme Court that the Obama administration and the organizations work out a compromise. However, the Little Sisters were forced back into court in November of last year by the attorneys general in California and Pennsylvania. The states are claiming that a religious exemption to the mandate violates the establishment clause of the Constitution. Senior Counsel Mark Rienzi with Becket Law, the firm representing the Little Sisters of the Poor, praised the Trump administration’s final rules. He criticized the remaining lawsuits in California and Pennsylvania. “Before 2014 when we had a contraceptive mandate millions and millions if not billions of people got contraceptives none or virtually none ever got them from nuns and that was okay,” he emphasized. The final rules on the mandate were praised Thursday by pro-life groups and House Majority Leader Kevin McCarthy (R-CA). “This rule will ensure religious believers and other moral objectors cannot be forced by the government to violate their most deeply held beliefs,” McCarthy said in a statement. “Pro-life organizations should not be forced into betraying the very values they were established to advance and this rule will allow such freedom,” Jeanne Mancini, President of the March for Life, commented. “March for Life bases its pro-life beliefs on ethics and science; the government has no right to demand that organizations provide health insurance plan options that explicitly contradict their mission; it is un-American. "We are very grateful to the Trump Administration for its work to protect such conscience rights,” she added. The American Civil Liberties Union and Planned Parenthood released statements claiming the rules will hurt women. “This rule will make it harder for hundreds of thousands of Americans, particularly women, to get the health care coverage they need," ACLU deputy legal director Louise Melling claimed in a statement. "This rule will be used as a license to discriminate and represents a chilling return to the days when the government treated women’s sexuality, and thus contraception, as immoral, perpetuating harmful stereotypes that have long been used to discriminate against women." Dawn Laguens, Executive Vice President of Planned Parenthood, claimed that “these attacks will hurt people — and keep them from getting health care, disproportionately impacting women of color and young people." "We support birth control access for all who want or need it, and we have to keep fighting to make sure everyone gets the health care they want or need,” she added.